Spaces for Change.S4C‘s director, Victoria Ibezim-Ohaeri was among the speakers that spoke to world business and political leaders, mayors and heads of municipalities in Africa at the AFRICITIES VII Summit in Johannesburg, South Africa. Her paper titled, “Institutionalizing Community Inclusion in Urban Governance” examined how the economic theories of privatization and liberalization have disrupted traditional land tenure systems, and imposed new models of land acquisition that exclude the poor and perpetuate their poverty. In the last decade, Nigeria has witnessed a dramatically increasing housing crisis. Nigeria’s housing deficit is estimated to be over 17 million units, and it continues to expand at the rate of 780 000 units per year, no thanks to the manifold forces militating against affordable housing financing and construction. The World Bank estimates that 720,000 housing units are required to be built annually for the next 20 years in order for Nigeria to be able to close the housing gap in the country. The explosion of slum communities in urban centres is also a direct consequence of severe housing shortage. Bearing the brunt of this lack of adequate housing is the urban poor, who are quite often, forcefully evicted from their traditional lands and places they call home. Lands taken from them are characteristically handed over to rich property developers who build luxurious high-rise apartments and middle-class subdivisions that are far beyond the reach of the poor. A recent example is Ijora Badia community that has a repeated history of forced evictions. On September 18, 2015, thousands of families were rendered homeless at the peak of torrential rainfall, leaving scores of women and children to sleep under makeshift shelters at the demolition site. The latest eviction exercise in Badia heightens speculations that the Lagos State Government will use the land now being cleared to expand its (Home Ownership Mortgage Scheme (HOMS) housing scheme, in which the monthly mortgage payment for the least expensive housing unit is more than ten times the typical rent for comparable space in Badia. In a related development, large hectares of communal lands compulsorily acquired in the public interest are handed over to foreign-owned corporations in the name of foreign investment. The terms of these investments are usually unfavorable to host communities, including the host governments and hurt the local economy. Tax holidays, subsidies, free trade zones, rent-free land and other incentives, are some of the conditionalities attached to these investment agreements that favor the corporations. On the other hand, the victims – the poor, the people – whose lands are expropriated to pave way for these “investment” projects are left without compensation, without a voice or opportunities to participate in the execution of the so-called business investments taking place right in their backyard. From the free trade zones in Ibeju Lekki, Lagos to the Ashanti-Gold mines in Obuasi Ghana, to the activities of Lonmin mines in Marikana, South Africa, poor communities across Africa regularly groan under poverty, forced land takeovers and human rights violations perpetrated by corporations. Problem Identification: Why does community exclusion and poverty persist? So, why do these destructive interventions persist despite elaborate efforts – such as the assortment of housing rights regimes – that have been out in place at the national regional and international levels to entrench inclusion, prioritize the needs of the poor and impose obligations on states to improve access to land and housing? In the same vein, why have strong commitments like the Habitat II Agenda, the IAI 2012 Recommendations not been fully adopted and implemented by local authorities across Africa? What exactly are the structural issues that have hindered progress, and must now be upturned to make significant changes realizable? Neoliberalism: Firstly, progress lags, and continues to lag because we have embraced the doctrine that the market holds the key to economic growth and developmental progress. Inspired by the economic theories of free trade and market liberalization of the nineteenth century, these policies inspired the structural adjustment plans imposed on governments in the Global South especially, resulting in massive privatizations of public property and the elimination of state participation in entrepreneurship, while liberalizing the movement of capital that are firmly in the grip of companies, business enterprises and large transnational corporations operating without any form of judicial or social control. Consequently, bowing to the dictates of these capitalist and neoliberal prescriptions, traditional land tenure systems all over Africa that ensured that everyone had access to land; to a living space and somewhere to lay his/her head have been uprooted and replaced with market models that emphasize the commodification of land. This disruption has seen land become commodified valuable property that the government now holds in trust for the citizens. On the other hand, the citizens, regardless of the permanence of their interests in land now have to go to the government to beg for validation of their titles, including paying exorbitant costs to have their landholdings instrumented. In effect, land has become so expensive, coveted and cornered by the rich and powerful, to the detriment of the poor. Agenda-Setting: Secondly, we need to ask ourselves: who is framing the global dialogue and campaign on housing rights and forced evictions? Who defines the content, messaging and scope of the housing rights regimes seeking to protect the poor against forced evictions and mass land takings at the national, regional and international levels? Are they truly being designed by the affected local voices, community actors in Lagos, Durban, Alexandra, Nairobi, Mali, Accra, etc? Or are their voices of the poor only being coopted at a later stage to legitimize predetermined objectives? In answering these questions, we must reflect on the distinction between invented spaces and the invited spaces of community activism and expressions. Communities naturally invent localized spaces through which they interact, support each other, express themselves, and make demands on local authorities to address shared concerns of collective significance. Allured by the promise of “supporting local efforts and amplifying their local advocacy demands”, global actors and bigger institutions have often been unconditionally invited into these spaces. Most of the time, this invitation significantly alters the balance of power, with one side dictating the message while the other side simply plays along. In the process, local voices often get drowned out and the credit for their local struggles transferred to the mightier side, which automatically shifts attention away from hitherto thriving, but unheard local organizations and their grassroot movements. There is no doubt these types of lopsided relationships are no longer viable from the social, political and advocacy point of view , necessitating the reconfiguration of alliances between the perceived weak and the mighty. 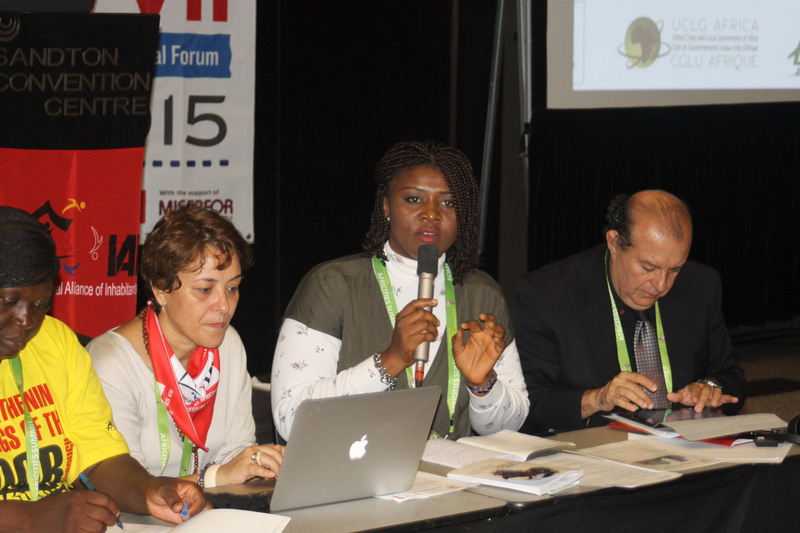 An African Agenda: Thirdly, are there homegrown initiatives that respond to local realities and contextual differences across African cities which can form the basis for developing an African agenda for Quito 2016? Are there existing vehicles of implementation that will be used to enthrone the redistribution of power, restructure unequal relationships and enforce commitments made and adopted at the global and international arena? The idea of a pan-African Network of Inhabitants that the International Alliance of Inhabitants (IAI) have just initiated could be the starting point towards institutionalizing community inclusion in urban governance at various levels: nationally, regionally and internationally. Should this then be the vehicle for institutionalizing inclusion and amplifying the voices of the poor, the local people who bear the brunt of urban deprivations? Should this be the corrective mechanism for righting past wrongs, and turning the wheel of action in the right direction? This is a question we must collectively answer.